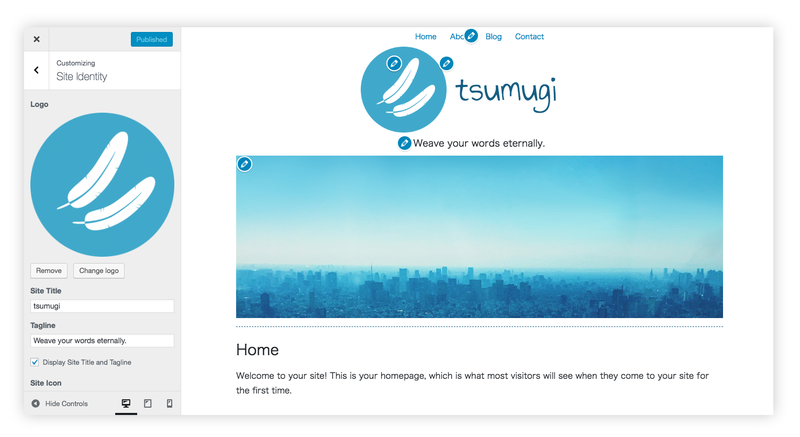 Create a website with simple WordPress theme "tsumugi" for blogging. You can build a website quick and easy with no technical knowledge. Just you need is writing. All templates and components are prepared. It’s installed with WordPress in fast and reliable server. Beautiful and simple design theme is activated. Bring a comfortable readability by responsive web design adapted to mobile devices. The theme author whom expert of HTML5 supports usage and customization. You can edit the site logo, header image, menus and all widgets as you want. Intuitive user interface and drag-and-drop uploader is provided. Over 5 thousand functional plugins are available too. This theme consists of a single column layout which is suitable for mobile devices and tablets along with PCs. You can put a navigation menu in the header area. Link to any pages or external URLs. Nested menus which behave as pull-down is available. You can put a logo image ahead of the site title. Make it remarkable for your site with the impressive logo. You can put a header image or video below the site title. How about reporting latest activities with a stylish photo or movie? You can put various components in the footer area. Let's compose your site with archive links, search box, calendar, photo gallery... and so on. 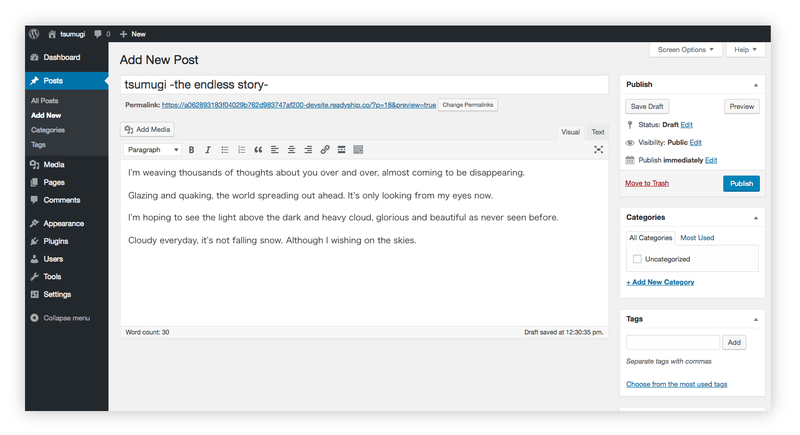 You can edit more useful theme options with the "Theme Customizer". Designing process is easy and quick so it can be checked in realtime. The name of "tsumugi" is inspired by the song "Tsumugi -amaneku omoi-" written by Hatsune(A Japanese singer-songwriter).